These yarns are truly breathtaking -- of the kind that makes you gasp and go oh-my-goodness-gracious! 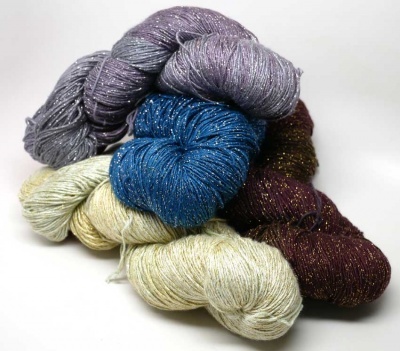 By Blue Heron Yarns, these are 88% rayon and 12% metallic. The yarn has a marvelous coolness to it; the overall feel is rather delicious. No need to fear that the metallic threads make it icky and scratchy -- this is a wonderful yarn and the hand is great. Each 8 ounce skein has 550 yards, thus giving you enough for many projects in one skein. My absolute favorite pattern for these yarns is a lovely free one from Knitty.com. 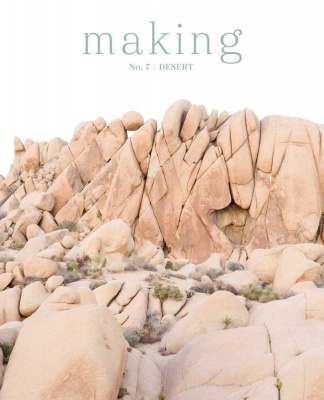 It is fairly simple and allows the yarn to really shine: Dunes from Issue #11 of Knitty.com. I've seen worked it up in this yarn -- unfortunately I don't have photos (I'd have had to rip it off the shoulders of the knitter I met). 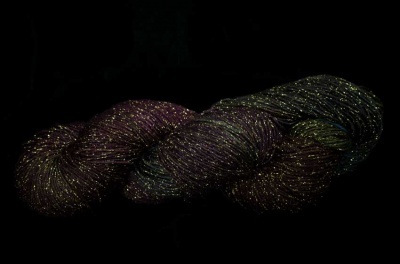 Another that seems to work very well with one skein is Mindy Ross's Early Morning Rain. 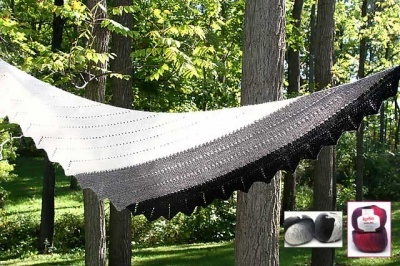 With or without beads, the yarn makes this a perfect wrap for warmer weather wear. Also, take a look at Midwinter's Hush by Simon Kereit. We have a webpage set up for it right now using other yarns, but notice that one of the original ones was knit using just one skein of this gorgeous yarn. We brought in a number of colorway you can choose from. Our Winter Sky is a most sophisticated beauty! This is dyed on a yarn with silver threads. Overall a play on grey and lilac. Striking -- a real stand-out. Indigo is a rich delight! 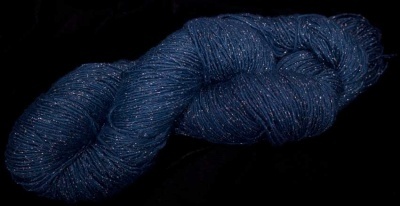 This is a tonal blend of deep blues with silver threads running through the whole. This is a very subtle variegation with just some of the blues being a bit lighter than others. Celadon is bright and happy, a true spring-or-summer look. 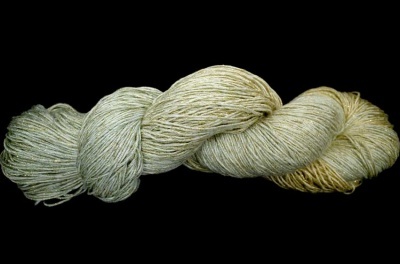 The metallic threads are gold; the yarn is dyed in a pale sage with slight variegations, some a bit more golden. Beautiful.